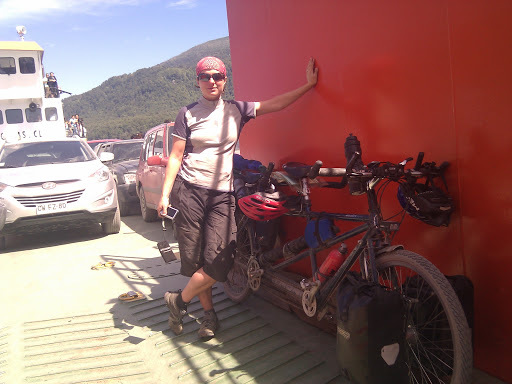 Exactly one month on from our last bike, hike, ferry, crossing into Chile, we find ourselves doing it all once more. Well, at least the ferry hopefully no hiking with the bike this time! Yesterday we spent most of the day in San Martin, catching up on some tasks including posting some unneeded and broken things back to the uk. Turns. out exporting items is complicated as you have to take it to the customs house first, then the post office, even though sending it by land to other south American countries can be done without hassle at any bus station! Anyway we worked it out in the end. The rest of the time there was spent deliberating our next move for ourselves, aware we're now about to enter our final month of travel and still have quite a lot we'd like to do! We looked into the possibility of busing right up to Mendoza, rather than cross back to Chilean lake district to continue north. However we're now off the main through roads - Bariloche would have been a better place for connections - so we're keeping with the original plan of heading to Temuco and seeing what we can arrange there. So the just left the small question of which of the three crossings to take. On chatting with various people at the hostel there wasn't a clear winner, so we decided to go for the closest pass and shortest route although this did mean ripio rather than paved roads. Possibly the wrong choice! The roads out of San Martin all go upwards. Even the road that runs along the lake the town is on has to go through a small pass first! We set off at 4pm planning to cover the 35km to the border and camp there, so we could easily get the 10am ferry next day. It took half an hour (and a couple bonus steep climbs) to even get onto the mountain road out of town, and then the constant undulations and teeth rattling surface meant by 8.30 we were still 5km from the border campsite, even though we'd covered over 40km (map distances are always a bit random) so we decided to stop at the first camping we passed. Unfortunately this turned out to be (a) closed, and (b) a mile off the road, downhill to the lake side. On the plus side this meant we were able to have the site almost to ourselves, with the tent pitched beside the still lake with a beautiful view of mountains in the evening and later very clear view of the stars. This morning we couldn't really face the 6am start to get to the border and through customs in sufficient time, so opted for a relaxed morning by the lake and take the 3pm ferry instead. Days are getting quite noticeably shortly now, as we're later in the summer but more significantly further north. We're now going to bed after dark more often, whereas we never saw the night sky when we first started out. And waking up at 6am was a shock as it was the first time we'd awoken and contemplated getting up in the dark this year! Going back to a work (and audaxing) routine is going to be a shock! Another consequence of our progression north is the border crossings are becoming more officious: there seemed to be twice the paperwork required, and our baggage had a cursory search for the first time (hiding bread and cheese in the sleeping bags was a smart move!). We're currently on the ferry up the length of Pirihueco. Every now and then we can catch a glimpse of the white cone on volcano Lanín - we'd have been right next to that if we'd taken one of the other passes. We should dock around half four, when we'll head up to the lakes of Neltume or Panguipulli to find somewhere to camp tonight. Our route through the Chilean lake district is still fairly undecided!